In the world of web development, the ability to speed up the process while still maintaining quality is often times key. Surely you’ve run into a scenario where there’s something that you want to do on your site, but you don’t yet know how. Rather than spending months researching and delaying your product, there’s binpress. binpress is a marketplace. But rather than purchasing an entire application or website, it’s a marketplace for source code. The goal is to offer high quality, high-level source code without the hassle of having to track down a developer that knows how to do it. From what we’re seeing, it’s a win/win situation for website owners and developers alike. Site owners spend less time finding the right code, and developers get to earn money from the code that they have created. Every piece of code is tested by professional developers and you can access the solutions in a variety of frameworks. We love the fact that binpress isn’t aiming to be the lowest common denominator in the code buying and selling game. Instead of looking for deep discounts, the site provides a full, classy landing page to really showcase the work of the developer. All code is fully licensed — there are a variety of licenses available, complete with a generator — and the marketplace standpoint makes sure that the developer gets paid. 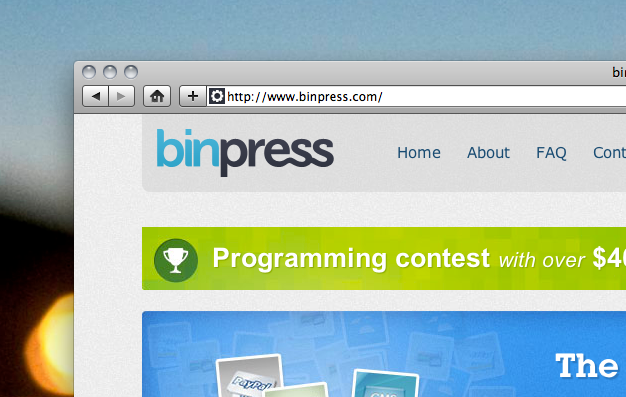 There’s not much more to say about binpress. It is, put simply, a storefront for your hard work. You’ve spent the time developing your code, now it’s time to get paid for it. Read next: 5 days with no Internet cost Egypt "At least $90 million"